Can you believe that Dr. Shapiro has been practicing in Denver for over 15 years? With all the friends and family he has picked up along the way, we got to thinking: wouldn't it be nice to have a special day set aside for showing thanks to all the wonderful people that make our work possible? 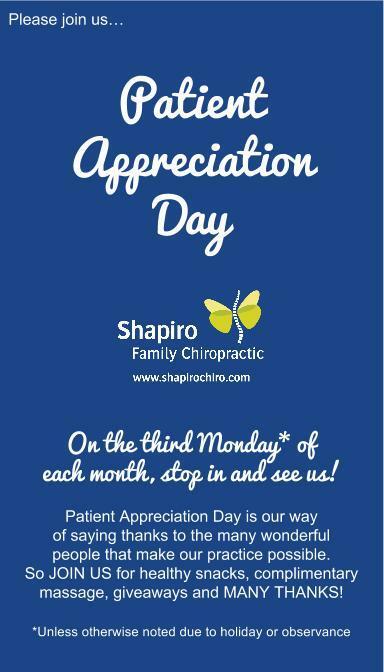 We had our first Patient Appreciation on August 18th, 2014 and it was a fantastic success! Our friends at EVO Hemp generously donated their DELICIOUS and NUTRITIOUS hemp bars to share with our patients. We also had giveaways and complimentary chair massage offered by our own in-house Massage Therapist.